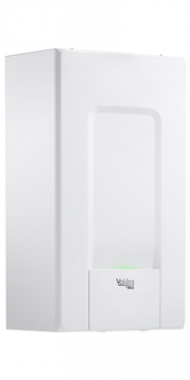 The Vokera Evolve combi gas boiler is a condensing wall mounted unit. It comes with a variety of features and benefits. This boiler is designed and manufactured by Vokera. A combi boiler supplies hot water and heating on demand by using the mains water supply this means you don't need to have a bulky tank or cylinder making them perfect for smaller homes where space is limited. It also comes with an output rating of 35kW, another way in which it makes it perfect for the homes that do not have an excessive need for heating or hot water (medium-sized homes). With this boiler coming with an efficiency rating of 94%, it is an A rated boiler. This boiler features a 77% SAP 2009 hot water efficiency. It is able to be connected with a BeSmart which can help to make the unit even more efficient that it already is. All of these features allow for a highly efficient unit. It is an easy to install unit able to help you to save money and time. The unit is available as a both natural gas or LPG boiler. This boiler also comes with 10 years warranty so you can have peace of mind that you are getting a highly reliable unit. Very poor boiler would give -5 if could. Recommended the boiler by gas fitter as comes lpg ready. This is about the only good feature. Had engineer out from Vokera 5 times and only been installed just over four weeks. Will not stop turning itself and having to manually reset all the time. Also the BE Smart, (which gives it 3 more years guarantee to 10 years, miles be ten minutes, wot a con), you need to be a brain surgeon to use, i am 27 and about only know how to turn the temperature up from heating, very poorly designed. Vokera have very reluctantly agreed a new boiler, but only after then asking how many times does it stop working and asking who said it needs a new boiler, your own engineer !!!!!!!!!! Keep away and buy a british brand. Rubbbish!!!!!!!! !